Older content from the Dan Hibiki tribute page, including the infamous Hibiki rap! when he does his Gadoken! and leave while you can! Hey, I finally have something to talk about on this page! Anyway, it's been confirmed on several gaming blogs that the home versions of Street Fighter IV will feature additional characters, including that master of Saikyo himself, Dan Hibiki. A page scan from the latest issue of the long-running Japanese magazine Famitsu was printed on Kotaku, revealing an older, pudgier, and slightly balder Dan. The redesign makes him look less like The Art of Fighting's Ryo Sakazaki and more like his middle-aged father Takuma. Oddly, while Dan has suffered the ravages of time, Ken and Ryu look roughly the same as they had in Street Fighter III... perhaps a little more rugged, but certainly no older. If you'd like to take a look at the Famitsu scan, you'll find it on this page, but be warned that it's very small and indistinct. You'll get a better feel for how the older but no wiser Dan Hibiki will look by clicking on this rough sketch. As for how he'll fight, there is no news yet on how that will change, but it's probably safe to assume that Dan will remain the mediocre martial artist he's always been since his Street Fighter Alpha debut. It's also a safe bet that Dan fans wouldn't have it any other way! THE SONG'S NOT OVER YET! Dan Hibiki's still making headlines, thanks to the recent release of Street Fighter Alpha Anthology for the Playstation 2. All the Dan you could possibly handle is packed onto this disc, including four Street Fighter Alpha games and the razor-sharp parody Super Gem Fighter Mini-Mix. There's even a hidden mode that gives you some (but sadly, not all) of Dan's wacky attacks from Marvel Super Heroes vs. Street Fighter. The Saikyo master's most memorable move, the Premium Sign, is nowhere to be found, but the super taunt can still be performed. Check the move list near the bottom of the page for more information. Just when you thought there was no new news to report on Capcom's beautiful loser, along comes Onikage88 with this Dan Hibiki tribute video. It's surprising that Dan still inspires this kind of fierce loyalty, even two years after Capcom gave Hibiki and the rest of the Street Fighter cast their pink slips. Anyway, click here and check out what Onikage88 has in store for you! The fight scenes could have used a bit more impact (then again, this IS Dan we're talking about...), but I dare you to keep a straight face when the training session starts! After a year long drought of Dan Hibiki news, we've finally got something new and exciting to report. SNK vs. Capcom, the latest and most highly anticipated Neo-Geo game in years, is currently being tested in a handful of Japanese arcades. 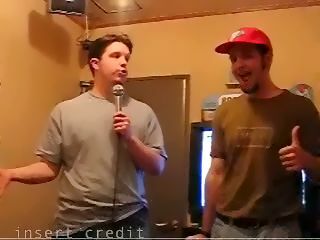 Contributors Chris Kohler and Matt DelGuidice had a chance to play the game while on assignment for the the gaming web site Insert Credit, and the two discovered that Dan Hibiki was hidden in SNK vs. Capcom as a midboss. The most surprising news is that Dan is one of the most challenging adversaries in the game. Neither Chris, Matt, nor the other testers at Neo-Geo Land were able to defeat the master of Saikyo. We're not sure what makes Dan so tough, but it's clear that he'll be getting a whole lot more respect after SNK vs. Capcom is officially released. We've been scratching our heads trying to figure out how to add new content to the Dan Hibiki fan page. After all, our man hasn't been getting many starring roles lately, and the last games he was in, Capcom vs. SNK 2 and Marvel vs. Capcom 2, were already released for the Dreamcast a couple of years ago. Since the present holds no new Dan-formation, we'll have to look to the past for this update. Let's look back to the mid 1980's. The Saikyo style had yet to be invented, but its most deadly attack may have been inspired in small part by one of Capcom's first games. The mediocre beat 'em up you see here was called Avengers in the United States, but was given the title "Hissatsu Buraiken" in Japan. That's pretty darned close to the name of Dan's flurry of punches and kicks, the "Hishou Buraiken". By the way, you can find the game included in Capcom Classic Collection Remixed for the PSP, but I hope you've got a better motivation to buy the collection than Avengers. Final Fight and Captain Commando, also included on the disc, are ten times better than Avengers could ever hope to be! Next up is Kuri Kinton, another substandard beat 'em up featuring a character that should be pretty familiar to fans of both Japanese cartoons and fighting games. Kuri bears more than a passing resemblence to Goku, the star of Dragonball and its sequel Dragonball Z. He's just as comical as Goku was as a child, and has the ability to charge up his inner strength and throw it in the form of a deadly fireball, a trick Goku learned later in life. However, if this attack isn't fully charged, Kuri's attack fizzles out before it goes anywhere, leaving the poor boy dumbfounded and the player wondering if Capcom borrowed this idea when it created Dan Hibiki. We've got Dan fan art! Dan fan art... hey, that's pretty fun to say. Anyway, these two drawings come from reader David Graham, who contrary to the rumors really DOES stay crunchy in milk. The first depicts Dan as a less than stealthy soldier. You'd have to expect that from him, but let's face it, he can't be much worse than Raiden from Metal Gear Solid 2. The second involves an understandable case of mistaken identity. Thanks for the pics, David... there haven't been many Dan Hibiki sightings lately and your drawings give us a good excuse to update this page. TAKE NOTES, THIS IS IMPORTANT! Sakura is not related to Dan Hibiki. I repeat... Sakura is NOT related to Dan Hibiki. I can understand how people would get this impression after playing Match of the Millennium on the Neo-Geo Pocket... when you team them up, Dan and Ryo are collectively referred to as The Big Brothers, and Dan mentions his "cute sister" in passing at the end of the game. That cute sister, however, isn't Sakura, and frankly, she's not all that cute either. You'll see her in Marvel Super Heroes vs. Street Fighter after you beat Cyber Akuma with Dan. It's probably more accurate to assume that Sakura Kasugano (another sure sign that the two are not related) trained with Dan Hibiki, since this was as close as she could get to learning karate directly from her idol Ryu. In one of the Street Fighter Alpha 3 endings, Dan proudly announces, "This is Sakura! I taught her everything she knows! ", to which she replies, "Oh, give me a break..."
I always thought Dan would make a great character in Saturday Night Slam Masters. Well, that's never happened, but if you've got Fire Pro Wrestling for the Game Boy Advance, you can introduce Dan to a whole new fighting arena and even pair him up with his wrestling counterpart Chris "Y2J" Jericho in tag matches. You'll need to create him in the character edit mode first, but this list of attributes should help you out. It looks like Saikyo Crusher is catching on with my readers... both Kao Megura and Mandi Paugh (he's the editor of the first Dan fan page, she's the backbone of the Official Mega Man Web Site) really enjoyed my work, and even Pat Reynolds, the world's foremost critic of the Saikyo style, admitted that he got a kick out of this page. But some of the coolest letters I've gotten about Saikyo Crusher have come from a martial arts Dan-sciple named Aaron Thacker. A while ago, he came up with a great name for the taunting Mortal Kombat ninja on this page. I considered calling him Vermin, but Aaron's own Flamingo is a better fit, so from now on, that'll be the character's name. I've decided to thank Aaron for his help by answering some of his questions about Dan right here on the fan page. He asked about a lot of stuff that I didn't think to include in Saikyo Crusher, so printing his letter and my response will also help make this page a little more complete. I wrote to you before and here I am again with some new questions about your favorite Street Fighter and mine, the pink panther of shotokan, Dan Hibiki. First off, I've read that Dan and his being a parody of Ryo came from a background picture of Sagat beating up what appeared to be an early version of Dan, and it said it was in one of the earlier Street Fighter games. Yeah, it was in a bit of press artwork promoting Super Street Fighter II (which Dan wasn't even in!). You can find it and a lot of other pics of Mr. Hibiki at another Dan tribute site, Saikyo.com. I remember in Street Fighter Alpha 2 Gold that whenever Ryu went up against Sagat (not vice-versa), Sagat appears to have just finished his victory over another fighter. It only lasts a couple of seconds, but I could just tell it was Dan, except he was in an orange gi costume and wearing sandals. Now was that Capcom's final attempt at making fun of SNK's Ryo (even if Dan was in the light of day of that game) or could it have been something else like Dan's father? I think it's supposed to be Dan. 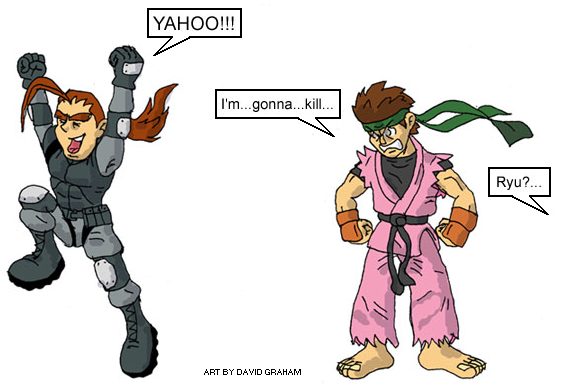 You see, Dan desperately wants to defeat Sagat for killing his father. If you play as Dan, it's actually possible to beat Sagat, but if you play as Ryu, it turns out that Dan was easily beaten and Sagat just tosses him away like yesterday's garbage. I'm sure that you know that Ryo is in the new Capcom vs. SNK, but unfortunately Dan wasn't. Gee I wonder why not? That would've been a neat fight! Well, there's always Capcom vs. SNK Pro, which is going to have a whopping two new characters... one of them is Dan, and the other is Joe Higashi, the wacky gator-eating kick boxer from the Fatal Fury series. Both of them made a cameo appearance in the ending of the first Capcom vs. SNK, but you couldn't play as them, which was disappointing (kind of like the game itself). Speaking of Capcom and SNK, you can pit Dan against Ryo right now in Match of the Millennium for the Neo-Geo Pocket. SNK's portable system is dead in the United States, and they're only making girlie mahjong games for it in Japan, but I still strongly recommend buying it. The Capcom/SNK crossover games alone make the system worth the investment... and there are a lot of other great games for the Neo-Geo Pocket as well. I also wondered... is Dan really Chinese or Japanese? In Alpha 2 his background is in Hong Kong, but in Alpha 3 he's in Japan and I know his last name is Hibiki. I guess he must be Japanese like Ryu, Akuma, etc., but I was just wondering. I think the designers intended for this to be a mystery... you know, like what Akuma does to his opponents when he performs the Raging Demon, or why Capcom keeps making Resident Evil games. I think I read somewhere (possibly Kao Megura's old site) that Dan's heritage isn't clear, although the name Hibiki is Japanese (suggesting that Dan is as well). And about Dan's background stage in Alpha 3, I don't know about that simple swing set in someone's back yard. Is it Dan's childhood home or yet another parody of something from Art of Fighting/King of Fighters? I never saw a round like this in any of the Art of Fighting or King of Fighters games, so I doubt it's a parody of them. I think it's more of a stab at Dan himself, hinting that he's just a child (skill-wise) in a sport of men. I've also seen Dan in some beautifully drawn manga parodies from Japan... (including) a flashback of Dan's father Go fighting Sagat. Go looks different than what he may be envisioned as, another parody from the Art of Fighting. Did the final boss of that game wear a goblin mask? Is that why Dan's father is envisioned in a very ugly cartoony sense? That's from the Video Game Museum, by the way. It's a great site for those times when you want to see what a game looks like before you buy or download it, or when you want to see the ending of a particular title you were never able to beat yourself. Anyways, Mr. Karate wears what's called a Tengu mask before he's revealed to be Ryo's father. A Tengu is a creature in Japanese mythology... he's a winged human with a very long nose and an arrogant personality. Dan's dead father always appears with a Tengu's face and nose for two reasons... the first is because he's a parody of Ryo's father Takuma. The second is because Dan is a little too confident of his abilities... sort of like a Tengu, who also has a high opinion of himself. Oh, and Dan finally makes his animated debut in Street Fighter Alpha: The Movie from Manga Video. I haven't seen it yet, but from the cel photos he looks pretty hip, not to mention he appears to have an earring on his left ear! I read he goes up against Vega, but is defeated... Oh dear, not good for his first anime appearance, but hey, Akuma and Sakura are in it as well! I heard Vega slices him up pretty badly... my friend Matt DelGuidice was wondering if he could have survived after that. But what the heck, the characters in Japanese cartoons take an incredible amount of damage and still manage to survive, sometimes with only a few cuts and bruises. Well, if they're the main characters, anyways. In the Gundam series, the heroes cut through dozens of rival mechs with ridiculous ease... I have to wonder why the Earth forces even bother to send out those Leos when they know they're going to be nuked the minute they enter the battlefield. It's worse than those episodes of Walker: Texas Ranger where Chuck Norris never gets hit, even once. Wait... nothing's worse than Walker: Texas Ranger. Well, that's all I have to ask and sorry this letter's such a long one. but since you're a Dan buff, you seemed to be the right guy to ask. Thanks. I hope I was of some assistance. In Japan, there's an incredibly popular comic and animated series called Ranma 1/2. In it, a father takes his teenage son to China to perfect his martial arts skills. Unfortunately, they decide to train near a series of enchanted wells, and while sparring, they both manage to fall into them. The boy, Ranma Saotome, takes a tumble into a well that claimed the life of a young girl centuries earlier, and comes out looking just like her. When the father, Genma, tries to scramble out of his own watery predicament, he sees two clumsy white paws clinging to the lip of the well rather than the hands he expects... he's become a panda! Now- oh, what does this have to do with Dan? Well, the thing is, in Cyberbots and Marvel vs. Capcom, there's a mech pilot who shares the last name of the main characters in Ranma 1/2. Oddly enough, Ranma's angry but easily confused rival is named Ryoga... Ryoga Hibiki. I'm sure the characters aren't related, but I get this feeling that the names were chosen as a tribute to the terrific Ranma series rather than just being a coincidence. On a side note, there are Ranma 1/2 fighting games... two of them were even released in America, although one was stripped of the license (and its personality) and renamed Street Combat. Unfortunately, none of them were outstanding. Furthermore, the previously mentioned Street Combat and the Japanese exclusive Ranma 1/2: Renaissance are among the worst fighting games available for the Super NES and Playstation... I haven't played the latter game, but j-pop editor Jason Thompson warned me that it's a hair-greyingly bad experience. Ironically, Capcom's never had the rights to the Ranma 1/2 comic, even though its Marvel vs. Capcom and JoJo's Venture game engines would more than do it justice. IS THIS THE END OF OUR UNLIKELY HERO? Charlie: "We've finally pinpointed the exact location of M. Bison's secret base!" Chun-Li: "Careful... I'm detecting life signs down there." Charlie: "Not for long! Bombs away!!!" 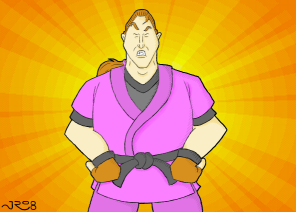 Dan: "My mastery of martial arts and this great new dojo guarantee that the Saikyo style will live forever! Right, Blanka?" Was Dan turned into so many self-confident charcoal briquets along with his hairy hombre Blanka? Maybe, but hey, this is Capcom we're talking about! They've snuffed Charlie twice, turned him into a cyborg, put their seal of approval on a crappy movie that claimed he was Blanka, and now has him buried in Marvel vs. Capcom 2, looking just like he did before his supposed deaths and whatever else Capcom's done to him. In other words, never mind the plot... if Capcom wants Dan in another fighting game, he'll be there even if they've thrown him into a volcano in the previous one.